A research project on the genetics of mountain goats has unexpectedly led to a new understanding of the geology of Baranof Island. 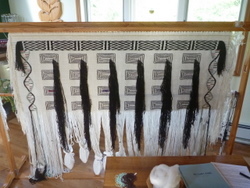 It’s also fresh inspiration for Tlingit master weaver Teri Rofkar. 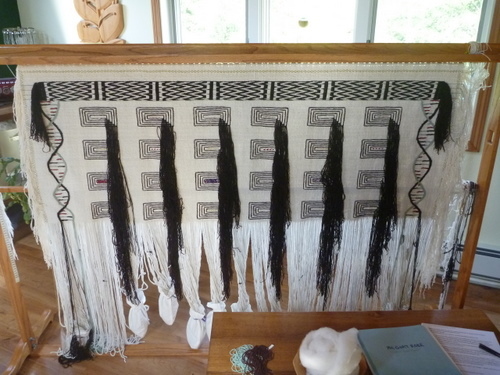 Last June, Sitkan Teri Rofkar was displaying some of her weaving samples at a festival of Southeast Alaska Native culture, when two passing scientists stopped dead in their tracks. “They said ‘Excuse me, but this is DNA?’” Rofkar said. DNA is the hereditary material that contains the biological instructions to make each living thing. The structure of DNA is called a double helix. Imagine a rope ladder that has been twisted at both ends. DNA is the most iconic shape in the world of molecular biology, but it’s not the type of image you would expect to see portrayed among the abstract geometric shapes and animal faces common in Tlingit art. Rofkar’s unique design was inspired by genetics research involving the source of her wool: the mountain goats of Baranof Island. Rofkar gets the wool she needs from hunters and spring hikers. This is a painstakingly slow way to collect the material for her art form. Kevin White is a researcher with the Alaska Department of Fish and Game in Juneau. Her samples eventually found their way to Aaron Shafer’s lab at the University of Alberta in Edmonton. They joined tissue samples collected by hunters from all over North America. 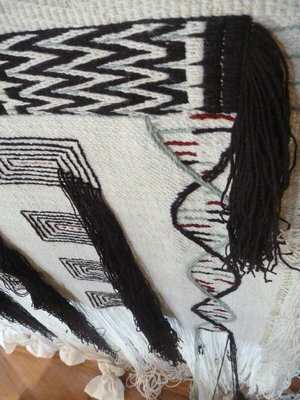 Because DNA is passed down from generation to generation, it holds a record of the biological past. When Shafer looked at the story told in the goats’ genes, he found it was different than the one told by historians. It was commonly thought that there were no goats on Baranof Island until 1923. In that year, the territorial governor oversaw the relocation of 15 goats from Tracy Arm, south of Juneau. Since then, the genes of only fifteen goats were duplicated, mixed and matched with each generation. These genes should be still present in what Shafer estimates to be over 2,000 goats on the island today. Shafer expected these 2,000 goats to be not much more genetically diverse than the original 15. The only time diversity increases in an isolated population is when mistakes are made during DNA copying. Shafer looked at a part of the DNA that tends to have lots of these mistakes so it is a good place for detecting differences among individuals. So Shafer expected that the genetic fingerprints of the goats on Baranof Island would be very similar, but in fact, they were really diverse. This diversity is good news for hunters and weavers, like Rofkar. Like investors that put money in different companies to minimize their risk, Baranof goats have a sort of diversified genetic portfolio. This means they may be better able to survive in an uncertain future than could include new diseases or changes in climate. By looking at other areas of DNA, Shafer found that most of the goats on Baranof Island are not related to the ones in Tracy Arm. He’s pieced together a story that he says best explains how the Baranof goats could be so diverse and so different from their supposed source population. Likely, during the last ice age, 20,000 years ago, part of Baranof Island was ice free, This part may have been a good place for goats to live. So most of the goats on Baranof today are probably the descendants of these ice-age survivors. It was only relatively recently, within the last century, that the newcomers from Tracy Arm dropped in. Shafer hopes news of the discovery will encourage hunters and citizens to continue supporting science. “By providing samples and giving us location information, which some people are a bit hesitant to do, what we’ve been able to do is piece together a pretty cool and controversial evolutionary story of mountain goats that has important implications for the history of Alexander Archipelago,” Shafer said. Rofkar notes that the oral history of Southeast Alaska supports the idea that there were ice-free areas on Baranof that supported life. As for how these large furry mammals could have gone unnoticed, Shafer thinks that maybe they didn’t. He has been combing through old Russian log books and finding references to mysterious “white deer.” Whether these were actually mountain goats will be hard to say for sure. He needs to find the diary from a Russian trader or sailor who clearly knows the difference between sheep, deer and goats. Rofkar delights in the differences between her way of conveying science through Tlingit regalia and how Kevin White, and other scientists are weaving their story.